consideration in the senior years. The effects and complications of a fall largely depends on the height one falls from but even a short fall from a high stool can have devastating consequences. In the elderly this may be more pronounced as age related changes particularly to the bones can leads to complications such as fractures that do no heal. Other consequences may depend largely on any hemorrhaging (bleeding) – in the elderly the widespread use of blood thinning drugs and weakening of the blood vessels can lead to very serious complications if there is bleeding from any site. Some of these complications may even be fatal. It is important for seniors and caregivers to be properly informed about the dangers of falls, the more likely causes and preventative measures that can reduce the likelihood of a fall or protective mechanisms that may at least limit its impact. Accidents will happen and this is no different for the elderly. However, the age related physical changes in the body coupled with underlying chronic conditions and possibly the side effects of certain medication does increase the chances of these mishaps. Changes in joint flexibility and muscle strength are expected with age and leads to some degree of physical limitation in the elderly. While this is not usually a problem in the everyday life of most seniors, it can be a major limitation that increases the chances of falls in the more adventurous. This is particularly the case in the elderly with musculoskeletal problems such as osteoporosis and arthritis and those who are not physically fit. Although age should not stop one from leading an active and fulfilling life, it is important for a senior citizen to be realistic about physical limitations as it would be for any person of any age. A person with conditions like Parkinson’s disease which is known to compromise gait, mobility and stability is at a greater risk of falls. 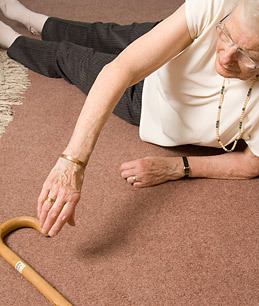 In fact falls are among the most common reasons why Parkinson’s patients are hospitalized. The senses such as sight, hearing and touch are important protective mechanisms that allow us to detect any potential danger. With age and certain diseases these senses become dulled to varying degrees. This can alter the way one interacts in their environment in many different ways and increase the risk of falls. Conditions like diabetes mellitus which is more common in the elderly is known to compromise many senses simultaneously. With age the chances of chronic conditions increases substantially and many senior citizens are taking several drugs for the management of various ailments. The side effects of some drugs and drugs interactions particularly when using several different types of medication can lead to dizziness, poor coordination, blurred vision and muscle weakness among other symptoms. This may increase the chances of falls.It is also more likely to occur when medication has been recently started or changed. Despite the physiological and medical factors, falls may happen for various other reasons such a loose rugs, slippery floors and ill-fitting footwear. Extra caution therefore needs to be taken, particularly in a person with medical ailments and on medication, to limit the potential hazards in the home environment. In the United States on 1st Nov 2005 there were an estimated 67,473 centenarians (people aged 100 or older).